As the calendar turns toward the holidays and the boys' high school hockey season really ramps up, The Hockey Hub’s Week Ahead returns for another year of alerting fans to what we feel are the top games of the week. Our top game of the week features shades of red, as the Red (Knights) Army goes up against the rolling Crimson of Maple Grove. It may not be a game that has section or conference implications, but it does feature two of the best Class AA teams in the state and a possible state tournament preview. Benilde-St. Margaret’s (5-1-0) figured to be in the discussion as the No. 1 team in the state throughout the season, but lost some of its luster in a 5-1 loss at Burnsville on Dec. 8. After holding a 1-0 lead through 17 minutes, the Red Knights were outscored 5-0 over the final two periods and dropped into the middle of the top-10. The Red Knights will face a similar squad Tuesday night against Maple Grove (6-0-1), which is a tight-checking, balanced team as well and has moved up into Benilde’s vacated spot near the top of the rankings. Make no mistake. When all is right with Benilde, it can score and score in bunches. The Red Knights have already posted 16- and 15-goal games this winter and average 7.67 goals per game. Senior Christian Horn (6-12-18) and junior Grant Besse (5-13-18) lead the team in scoring and both feature terrific ice vision and a sniper’s shot. But they’re not alone, as the Red Knights have three – and sometimes four – lines that can score on any shift. T.J. Moore (8-6-14), Dan Labosky (5-9-14) and Jake O’Borsky (5-8-13) have started with big seasons up front. 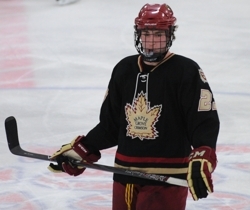 Tyler Ellegard (3-4-7) can play all over the ice and has split time at forward and defense. On the blue line, Jake Horton (4-4-8) anchors a young group along with Hill-Murray transfer Jonah Johnson (1-2-3) and Patrick Graham (0-5-5). Jack Glover (1-6-7) and Ryan Collins are both just sophomores, but are highly-regarded and play like upperclassmen. They support Anders Jecha (.898 save percentage), who has played nearly every minute in nets. Maple Grove hasn’t lost a game in the very tough Northwest Suburban Conference in two years, as the Crimson were 16-0-2 last winter and have already beaten five conference opponents this season, including rival Blaine (6-3 on Dec. 8). Their only non-victory was a season-opening 3-3 tie against Wayzata in the Thanksgiving Turkey Trot at Plymouth (Maple Grove did advance to the finals in a shootout, but the game goes in the official books as a tie). Junior Jordan Gross (7-10-17) has really opened eyes and has been called by many as the best all-around defenseman in the state. He’s adept and using his speed and puck-handling skills to enter the offensive attack, but still never seems to get caught defensively. Drew Aspinwall (1-4-5) is a physical defenseman and team leader, while Jordan Freberg (0-4-4) can also add offense from the blue line. Senior Kyle Koop (.901 save percentage) has taken over seamlessly from graduated All-Stater Ryan Coyne in nets. Up front, senior Dylan Steman (8-7-15) is the lynchpin of a deep group of forwards such as Tony Paulson (4-5-9), Shane Wolden (5-3-8), Spencer Bell (4-4-8) and Alex Mason (3-3-6). The Spuds program celebrates a half century of play by welcoming the Rams to town. The Zephyrs and the Cadets are no longer in the same class but are still members of the Metro East Conference. The No. 3-ranked Trojans meet the No. 4-ranked Cadets in a Class 2A showdown. White Bear Lake had lost 14 straight games in the biannual series against Hill-Murray until last year’s 5-4 double overtime shocker in the Section 4AA final. It should bring some added fire to this already heated rivalry between the frequent playoff opponents. Neither team is ranked early in the season, as Hill-Murray (3-3-0) stumbled out of the gate and the Bears (4-2-1) are building up their resume after graduating a very strong top scoring line. Mitch Morrisette (10-10-20) has been picking up the slack for the Bears, who also have enjoyed the addition of young Jake Wahlin (5-9-14). The Pioneers are led by Jake Guenzel (3-8-11) and strong goaltending from John Dugas (.929 save percentage). This should be a great Tuesday night showdown between a pair of former Lake Conference teams who have gone their separate ways. Eden Prairie (4-1-1) has been a surprise squad thus far, as the Eagles have recovered nicely from the graduation of its historic Kyle Rau-led class. The Eagles are doing it with goaltending and defense, as they’re only scoring three goals per game. Sophomore netminder Derrick LaCombe (.936 save percentage) has been particularly impressive, shutting down powerful Eagan with 38 saves on 39 shots in his first varsity start. Meanwhile, Burnsville (5-1-0) is rolling along at 5.83 goals per game and a five-game winning streak that includes big wins over Benilde and Hill-Murray. Cory Chapman (7-9-16) leads the offensive onslaught for the Blaze. Last season – as it seemingly has every year for the past decade – the Section 8A race came down to these northwestern powerhouses. While Warroad (4-3-0) had the upper hand in seven of the previous eight seasons, Thief River Falls (5-1-1) ended that dominance last year with a state tournament berth and eventual third-place trophy, the school's first since 1959. The Prowlers appear to again be the favorite and they’re doing it with a defense that has allowed just two goals in the past three games – all victories. The Warriors have won just one of their past three games while scoring a total of five goals. This one should be low-scoring and tight-checking, which wouldn’t be a surprise in this series. Two of northeastern Minnesota’s best Class A teams renew acquaintances in this Lake Superior Conference showdown. Neither has lost to a Class A team yet this year, as Duluth Denfeld (6-1-1) only has a blemish on opening night against Roseville and Hermantown (5-0-0) is unbeaten overall. The Hawks are one of the stingiest defensive teams in the state with a blue line crew that includes Jared Kolquist, Brian LeBlanc and Jake Zeleznikar. Matt Mensinger (.919 save percentage) had done a great job filling in between the pipes in his first starting gig. Denfeld features high-scoring Levi Talarico (9-12-21) and a great addition in second-leading scorer Nick Forbort (5-7-12). Are records deceiving? In this case, we’ll get a chance to find out when struggling Bemidji travels to unbeaten Brainerd. The Lumberjacks (4-3-0) had lost three of four games until getting their offense on track with a big win over Monticello/AML. But Bemidji was expected to be one of the top teams in Section 8AA with a deep returning lineup that includes Matt Serratore (5-5-10) and John Forseth (5-3-8) leading the way. On the other hand, Brainerd (7-0-0) has raced out of the gate despite the graduation of Mr. Hockey finalist Josh Archibald. Mitch McLain, Matt Pohlkamp and Aaron Rich have already combined for 32 goals although beginning with this game, the Warriors’ schedule now gets tougher. Eagan’s toughest competition in Section 3AA figures to come from a handful of teams that includes Apple Valley, although most are predicting another trip to state for the Wildcats (4-1-0). We’ll get a good look at Eagan against one of its section foes, as the Eagles (3-2-0) host the South Suburban Conference tilt. It’s tough to talk about Apple Valley without mentioning what could have been, but that’s a disservice to players such as Tate Erickson, Jordan Ocel, Sean Lang and Derek Smith. The Eagles are struggling offensively, though, as they’re averaging just two goals a game. Eagan has plenty of firepower, led by Will Merchant (8-7-15) and Michael Zajac (5-9-14), and score 6.4 goals per game. Coach Greg Trebil’s last season behind the bench has gotten off to a rocky start for Holy Angels (1-3-0), which has lost its last two games by a combined 21-7 score, including a rare defeat in Missota Conference play to Chanhassen. Things don’t get any easier for the Stars, as they host unbeaten Breck (5-0-0), the top team in Class A Wednesday night in a showcase game for both OTSN.tv and MyFoxHockey. The Mustangs have scoring power across the board, as all three lines can put the puck in the net. Thomas Lindstrom, Matt Colford and Wesley Iverson share the goal-scoring lead with six each. Mario Bianchi (5-8-13) leads the Stars in scoring, but offense hasn’t been a problem for Holy Angels, limiting the opponents has. The Stars are allowing an average of 7.4 goals per game. We’re stepping outside the box – or at least outside the Metro area – for the next game of the week between Section 3A rivals Litchfield/Dassel-Cokato and Marshall. The two teams should be among several contenders for the section title. Marshall (6-2-0) has an early edge by beating both Hutchinson and New Ulm by a goal already this season. Bryce Peterson (6-5-11) leads the Tigers, who are looking for their first-ever state tournament bid. The Dragons (5-1-0) have been to state as recently as 2008. John Raisanen (6-8-14) and Max Hyberger (7-3-10) lead the offense, while Braeden Wahl (.885 save percentage) has done a nice job in his first full season in nets. Two teams who don’t get much love in hockey circles will do battle tonight – and barring a tie, one will come up with its first victory of the season. For St. Paul Highland Park (0-8-0), it’s been a rough reintroduction into high school hockey. The Scots were winless last winter in their first season since the program disbanded in 1987. Pine City/Rush City (0-6-0) won five games last winter but is still seeking its first this year. Both teams have had trouble putting the puck in the net. The Dragons have scored just five goals and Adam Swanson (2-2-4) is the only player with more than one. The Scots have 11 goals, with Grant Vernon (3-2-5) and Adam Tjaden (3-1-4) leading the way.